Millie Bobby Brown Starts Filming 'Stranger Things' Season 3! Millie Bobby Brown has officially started production on season three of Netflix’s Stranger Things! 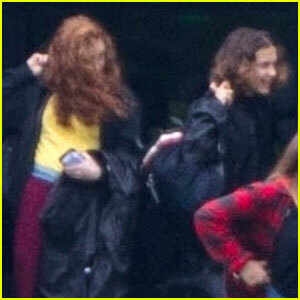 The 14-year-old actress was spotted arriving on location ahead of a busy day on Thursday (April 26) in Canton, Ga.
Millie, aka Eleven, was joined by her co-star Sadie Sink, who portrays Max Mayfield, as well as The Duffer Brothers, creators Matt and Ross Duffer. 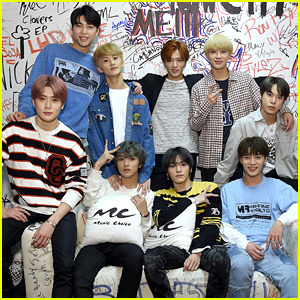 The eight-episode third season does not yet have an official premiere date. 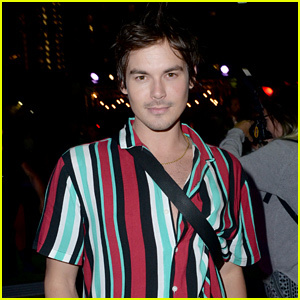 Keep checking back with Just Jared for more updates. Watch a behind-the-scenes video of the cast beginning production below! 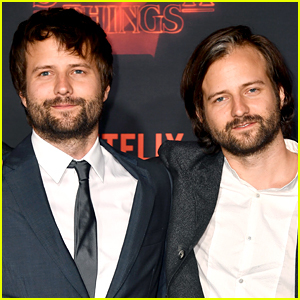 The Duffer Brothers – Matt and Ross – have been accused of verbally abusing women on the set of Stranger Things and they’re responding the allegation. Peyton Brown, a crew member on the first two seasons, posted to Instagram saying that she would not return for a third season because of the alleged abuse. Rachel Brosnahan keeps it chic and sophisticated while hitting the red carpet at the 2018 Writers Guild Awards New York held at the Edison Ballroom on Sunday (February 11) in New York City. 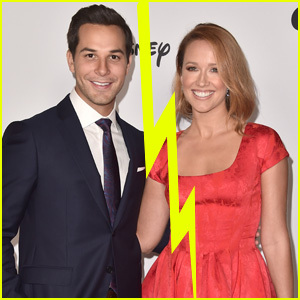 The 27-year-old Marvelous Mrs. Maisel star was joined at the event by Rachel Dratch, Tina Fey, Adam Pally, Anna Chlumsky, Lucas Hedges, Julie Klausner, Seth Meyers, and Tracy Morgan and his wife Megan Wollover. The award ceremony was simultaneously held in both New York City and Los Angeles, with Late Night With Seth Meyers writer Amber Ruffin hosting in NYC, while Patton Oswalt hosted in LA. Attendees at the LA ceremony included Kathy Griffin, Get Out stars Marcus Henderson and Betty Gabriel, Dylan McDermott, Nicholas D’Agosto, Shape of Water‘s Guillermo del Toro and Vanessa Taylor, and Stranger Things writers Matt and Ross Duffer. For the full list of winners of the 2018 Writers Guild of America Awards, click here! FYI: Rachel is wearing a Saint Laurent jumpsuit. Jordan Peele Wins First-Time Feature Director Award at DGA Awards 2018! 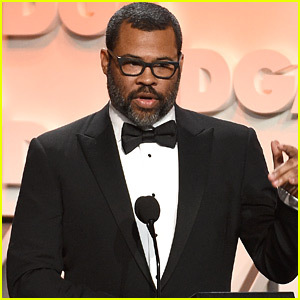 Jordan Peele hits the stage to receive the award for Outstanding Directorial Achievement in a Feature Film during the 2018 Directors Guild of America Awards on Saturday night (February 3) at the Beverly Hilton Hotel in Beverly Hills, Calif. The 38-year-old director received the award from Get Out stars Bradley Whitford and Betty Gabriel. Other stars at the event included Gugu Mbatha-Raw, Aisha Taylor, Kevin Bacon, Kyra Sedgwick, Jon Favreau, David Hasselhoff, Guillermo del Toro, and Stranger Things creators Ross and Matt Duffer. FYI: Betty is wearing a Rami Al Ali gown. Kyra is wearing a Zuhair Murad dress, Sarah Flint heels, and Chopard jewelry. Did The 'Stranger Things' Creators Reveal a Season 3 Is Happening? Stranger Things actors Paul Reiser, Finn Wolfhard and Linnea Berthelsen attend the Vulture Festival’s Stranger Things: Inside the Upside Down at Hollywood Roosevelt Hotel on Saturday (November 19) in Hollywood. The co-stars were joined at the panel discussion by the creators of the show Matt and Ross Duffer, as well as one of the producers Shawn Levy. During the event, the cast and crew discussed season two and may have accidentally spilled the beans on a season three! 'Stranger Things' Season One Almost Never Happened! Did you know that Stranger Things almost never made it to Netflix? 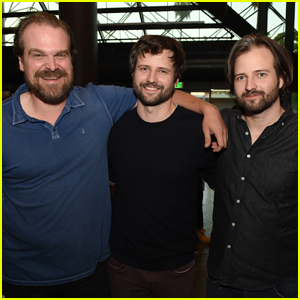 The show’s creators Matt and Ross Duffer as well as actor David Harbour stepped out to talk about the show on Thursday (August 17) at the Directors Guild in Los Angeles. The trio was also joined by much of the show’s creative team including producer Shawn Levy, casting directors and music directors. During the panel discussion, Matt revealed that no one wanted to hear about Stranger Things at first, which was originally being pitched as a movie. 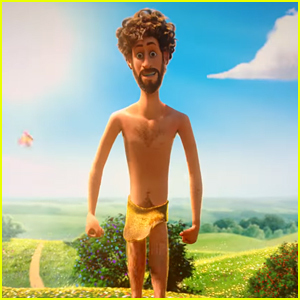 “Nobody wanted to hear movie ideas. They wanted to hear television ideas,” Matt explained. Instead of totally dropping the idea, they decided to craft the project for a TV space.